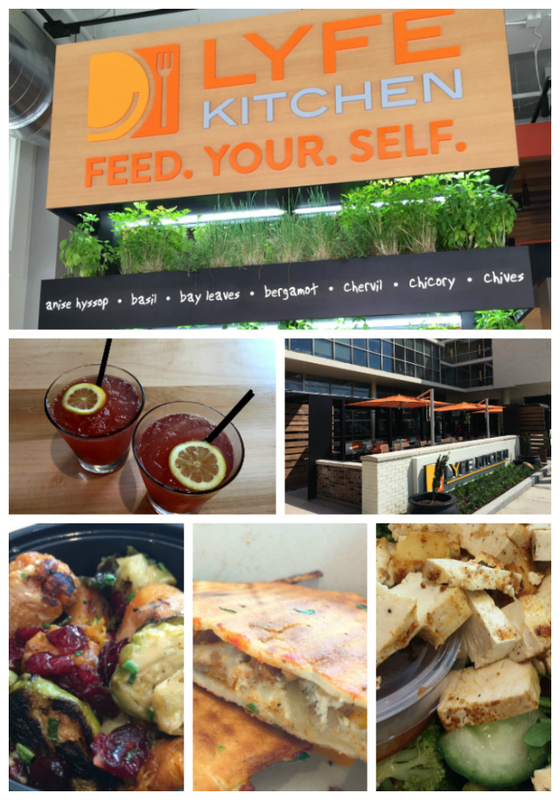 Love Your Food Everyday at LYFE Kitchen, Memphis. How could I not check out a restaurant whose name is an acronym for loving food? 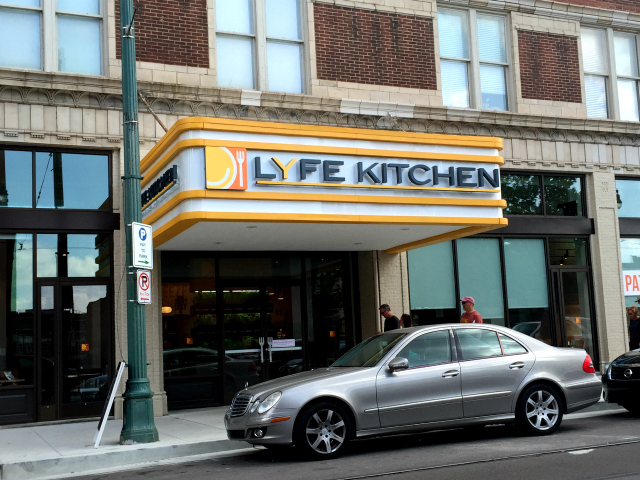 I had an incredible meal to-go from LYFE Kitchen in downtown Memphis, Tennessee and want to share it with you today. 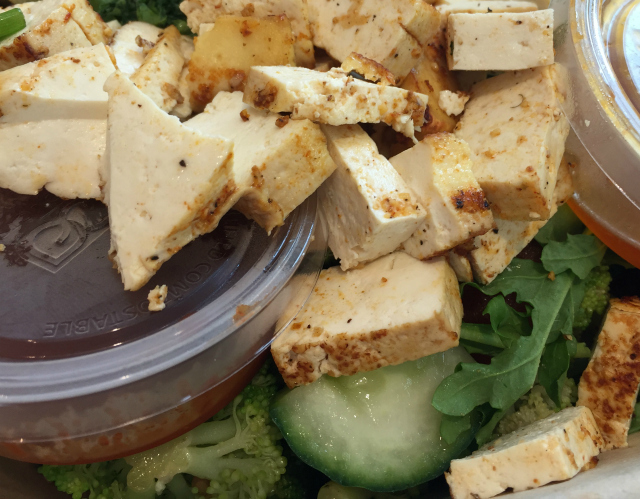 Wholesome, flavorful, healthful food in a fast casual setting? Yes! As I mentioned in my earlier posts about our trip to the Memphis in May Beale Street Music Fest, we ran into a bit of weather. It rained and rained. There was a windstorm. Then there was sun and humidity. Yet we made the best of it and had an absolutely grand time in Memphis. Every time I visit Memphis, it’s almost too much fun. Almost. And there is always amazing food. 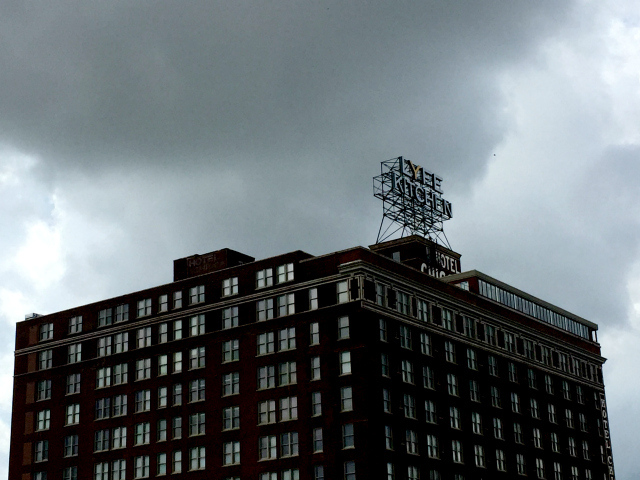 On our last full day in Memphis, during a rainstorm, we decided to talk a walk around downtown. Because walking in the rain is fun and downtown Memphis is very walkable. From blocks away, we could see the LYFE Kitchen sign high atop the early 1900’s Chisca Hotel building which is now apartments. It looked like the rain was going to end soon, so we decided to grab food to go and stash it in the hotel fridge for a late dinner after the festival. Perusing the menu quickly revealed many options for me. The menu is clearly labeled with gluten-free options and vegan options, as well as a notation for each dish that contains nuts. 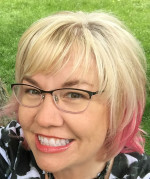 But it got even better when ordering at the counter–when I was asking all of my usual gluten-free questions, I learned they notify the kitchen when a gluten-free diner is gluten-free by necessity and take many extra precautions to safely prepare the order. While there is a CYA statement on their menu, I felt as though my concerns were addressed and my meal carefully prepared. While we waited for our to-go order, we ordered cocktails from the bar. 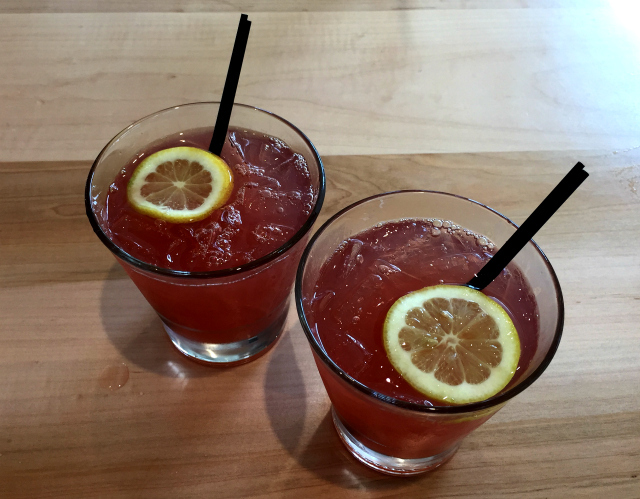 We both had a fruity lemonade with bourbon. Light to be a bourbon drink, which was perfect as the grey skies were opening up to what turned out to be a very warm and humid afternoon. When I see these on a menu, I have to order them. 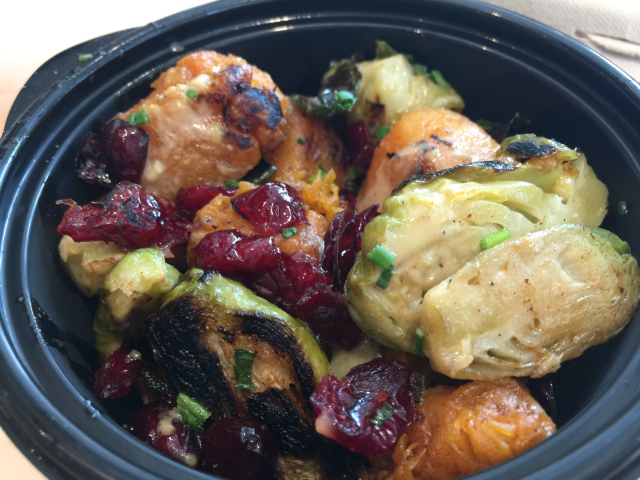 Roasted Brussels sprouts and squash with dried cranberries and a dijon vinaigrette were absolutely perfect. A nice roasted char on the sprouts, not too much dressing plus it was a plentiful serving for the price. My favorite fella ordered a side salad since he was having a sandwich-type thing. 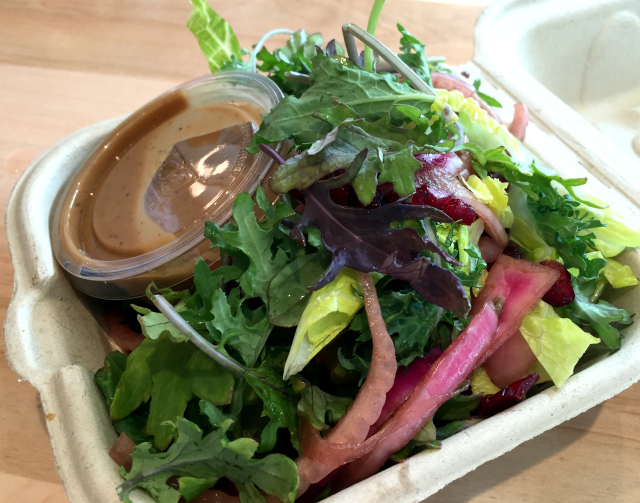 The kale and cranberry salad with pickled red onions and a balsamic vinaigrette was another generous serving size, packed full of greens. 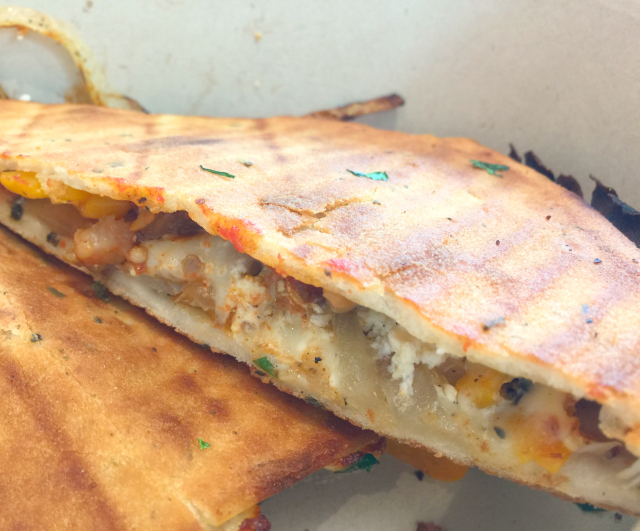 To go with that salad, the Italian flatbread with grilled vegetables, goat cheese, mozzarella and basil in a stuffed pizza-style sandwich with pomodoro dipping sauce. It was nice to see their flatbreads were available gluten-free. This didn’t make it back to the hotel; we split it on the way back. I ordered the quinoa crunch bowl with a gluten-free tabbouleh, crunchy vegetables, avocado, arugula, a hummus made with edamame, chipotle vinaigrette and their fireman’s hot sauce. I added garlic lime tofu, but the bowl would have been a substantial meal even without the tofu. I did enjoy the flavor of the tofu though! We also grabbed a couple of desserts, which were the perfect size for me. Not only do I appreciate a $3 dessert, I appreciate a dessert that isn’t large enough to be a meal by itself. The chocolate budino included pomegranate, chia seeds and toasted almond. 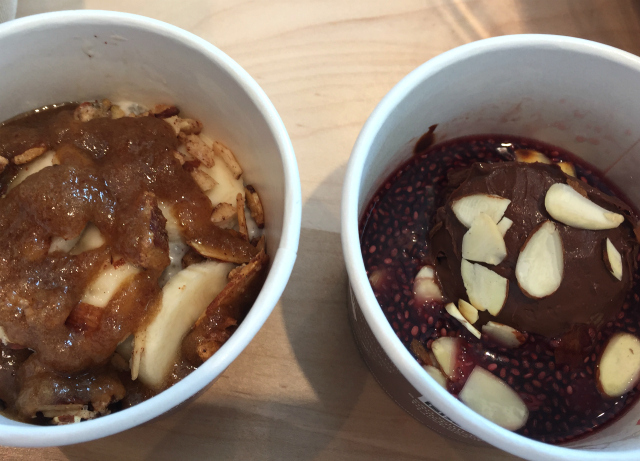 The banana coconut budino also had chia seeds, a nut crunch and a caramel sauce made with dates. 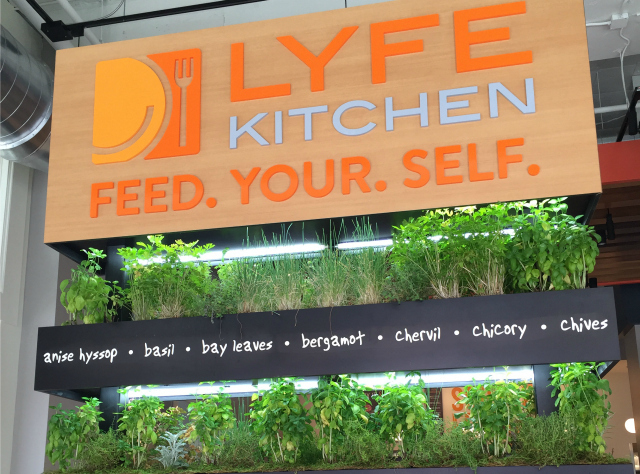 While it isn’t common for me to review a chain restaurant, I am impressed with LYFE Kitchen and will make an effort to dine with them when I am in other cities where it is an option. Currently there are locations in Memphis (another in addition to the downtown spot), Chicago, Plano, Denver, Vegas and several California options. 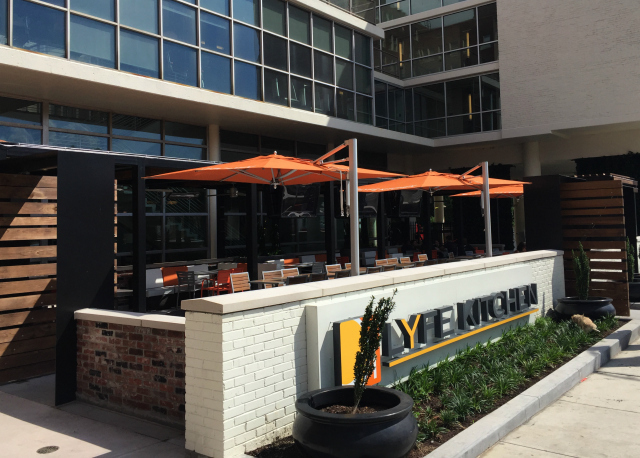 The LYFE Kitchen I visited is located at 227 S. Main Street in Downtown Memphis, 901.526.0254. Street parking seemed a good option. There was indoor seating as well as a lovely sidewalk patio. I definitely enjoyed everything there! I usually seek out local chef-driven restaurants because they have the capability to more easily modify dishes, but with a spot like LYFE, it’s just as easy!